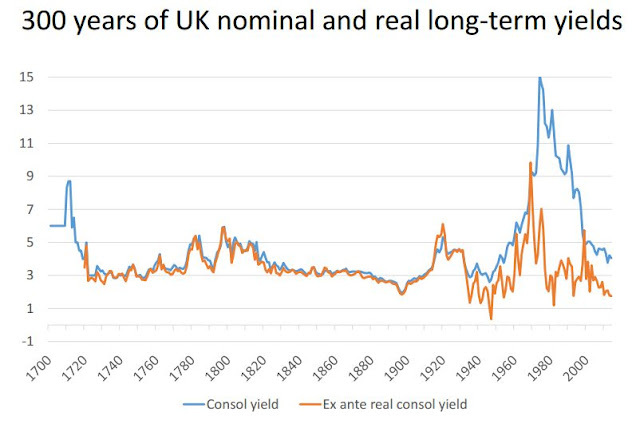 It is very evident that for most of the last 200 years, nominal and real consol yields have been pretty much pinned together. Charlie said that the gold standard prevented rates deviating by keeping the price level under control. But I am unconvinced by this. Firstly, let's look at the historical record. In 1717, Isaac Newton, then Master of the Mint, changed from defining the value of the pound in silver as had traditionally been the case to defining it in gold. At that time, most banknotes were issued by commercial banks: the Bank of England issued notes in return for deposits, but for high denominations only and the amounts were variable. After the Bank Charter Act of 1844, which ended the issuance of banknotes by commercial banks in England and Wales (though not in Scotland or Northern Ireland), the Bank of England gradually moved to issuing notes for fixed amounts and lower denominations. But for much of the century, banknotes were issued in high denominations only and were not widely used, except in Scotland where a £1 note was popular (as it still is today). Most people used coins for everyday transactions, principally small-denomination silver coins. For all practical purposes, therefore, what Britain actually had during this time was bimetallism, rather than a gold standard as we would understand it now. But no matter. War destroys gold standards, whether bimetallic or paper. Even though the gold standard only really applied to high-denomination bank notes, not the common currency used by the people of Britain, when Britain went to war with France in 1793, gold convertibility came under increased pressure as investors retreated into outright holdings of gold. The Bank of England eventually suspended gold convertibility in 1797 after a series of runs on the Bank threatened to drain its gold reserves. Convertibility was not restored until 1816 after the ending of hostilities with France. And yet the fact that gold convertibility was abandoned for nearly twenty years barely creates a ripple on Charlie Bean's chart. Both nominal and real rates rose, but in parallel with each other. Price level rises are common during and after wars because of supply-side destruction coupled with very high government spending: the price level rise during and after World War I is also very evident on this chart. 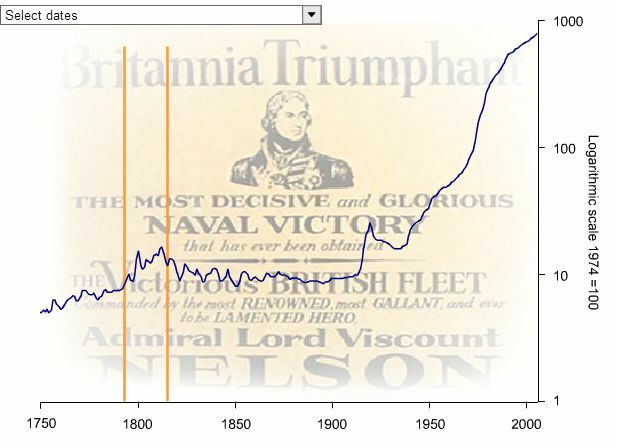 The price level rise is sufficient to explain rising yields during the French Wars. But it doesn't explain why real and nominal yields didn't diverge during a period of high inflation and suspended gold convertibility. There must have been some strong nominal anchor keeping them pinned together. It certainly wasn't inflation targeting. Anyone hazard a guess as to what it was? I reckon it was a fixed exchange rate, but I could be wrong. But the real story on this chart is, of course, the Great Divergence of real and nominal yields. Ever since the Great Depression, nominal yields have been persistently above real yields, often by a substantial margin. Even during Bretton Woods, a period of relative financial stability (and a quasi-gold standard), nominal yields were somewhat above real yields. Yet in the previous 200 years, despite periods of fiat currency and high inflation, real and nominal yields didn't diverge. Why do they now? This is not just an idle question. The yield on consols (interest-bearing government perpetuals) is a proxy for the risk-free rate of interest. If nominal yields are persistently above real yields even in the absence of significant inflation, then something is massively askew in the pricing of risk-free assets. Today, inflation is hovering around zero, but Charlie's chart shows us that nominal yields are about two percentage points above real yields. I thought the post-crisis period was supposed to have euthanised rentiers? This chart suggests that they are doing better than ever. Perhaps what this divergence tells us is that our expectations of future returns are persistently skewed to the upside. We therefore undervalue safe assets (hence high nominal yields) and overvalue risky ones. As Andy Harless says, safety is a scarce and valuable asset. Arguably, it should be a lot more expensive than it is. Perhaps we don't really think it is necessary - or we don't really think these assets are safe. But why did everything change in the Depression? I don't buy the gold standard argument. Rather, I think that the cataclysmic shocks of the 20th century have weirdly distorted our view of financial reality. 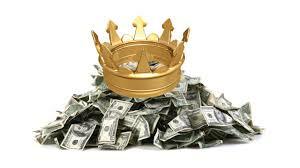 The fact is that a significant proportion of the human race now expect to receive returns on financial assets that are far removed from the real ability of the economy to generate them. I don't know why this is, but in my view we should be looking at things like labour market dynamics, longevity and pension expectations. And we need to look at them as a matter of urgency. Such divergence between nominal and real rates suggests that there is a continual drain of resources from workers to rentiers, from young to old and from poor to rich. This shows itself as rising indebtedness among the young and poor, and increasing fragility of the global financial system. It cannot possibly be sustainable. "It would be better to find ways of raising the natural rate through structural and fiscal policies." Indeed, somehow we have to bring nominal and real rates back together. Ideally this would be through raising the natural rate. But I suspect the post-Depression natural (real) rate is lower than we would like it to be, and it's just taken us best part of a century to understand this. If so, then this is not simply a matter of getting fiscal and structural policies right. It raises serious questions about the ordering of society. After all, a large number of people depend on there being significantly positive real returns on essentially risk-free assets. If significantly positive real returns on risk-free assets are a thing of the past, we owe it to those people to stop pretending we can restore their lost returns through "confidence-boosting fiscal adjustment" and "growth-friendly structural reforms". They simply aren't going to be able to live comfortably in their old age on the interest on risk-free savings. The truth is we do not know when, or if, positive real returns on risk-free assets will return. If the future path for growth in future is low to zero, then they may never return. If this is the case, then the solution to the "Great Divergence" must be for nominal risk-free rates to drop. Permanently. Very good, indeed. I agree completely. It is wrong to create a distinction between "workers" and rentiers in this context. In truth both are engaged in the act of accessing the still massive industrial surplus. They clearly do not "work" in a classic sense. Rentiers in the centralized state do have the advantage but we are clearly seeing a breakdown of the production / distribution / consumption system which is larger then all groups in terms of its fundamental significance. However barring efforts to destroy the industrial surplus via industrial sabotage efforts it still exists and has not gone away. Douglas thinking on the subject was anti absentee landlord like behaviour and the wider capitalistic system of the freely transferable share which results in nobody having skin in the local game. Essentially if you live in a property or work the land you own it. 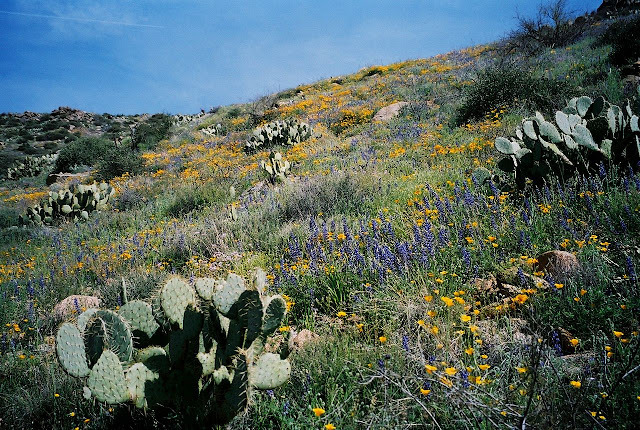 A person who receives a inheritance must live in the house or farm the land etc etc. If not (say within a year) he loses it to the state which then offers it for immediate resale in the private market. Corbyns latest socialist land grab is a very predictable policy option for the centralized state. A sad reflection on the absence of conservative distribution voices on these islands. The level of power concentration today is extreme ,people with access to inside information can now digest virtually all of the surplus forcing everybody else to work for them and not for the common good creating the current production / consumption crisis. Sadly we do not live in a organic bottom up society. I have recently come across a vintage British produced product. Today it can be pretty difficult to get your head around the concept of medium scale British manufacturing but I amazed at its quality. Its a Blacks of Greenock ridge tent dating from the late 60s/early 70s. I think the old company went under during the early 80s. Not a tent I would like to out up in a storm but the fabric is the highest quality I have seen in a tent. Douglas did not much like the Showell Styles or Tommie Weirs of pre and post war UK (representing as he did the Farmer Maggot types rather then directly the people desperate to escape the Satanic mill) but looking at the product (which Styles improved himself) one fears that all is lost. A chronic lack of local production is coming back to bite the UK. This after Hundreds of years of outsourcing. The history of a small British company - the decline. 1976 October. Following many years of negotiation, acquired by mutual agreement the old established firm of John Edgington & Co. Ltd., of 108, Old Kent Road, London - tent makers and hirers, and suppliers of fine camping equipment par excellence since its inception in 1805. The latter half of the seventies however, saw Blacks in recession and in decline. All similar firms were in the same position. 1977-79 Acquired Vango (Scotland) Ltd., 47, Colvend Street, Glasgow, which became an associated company within the group. Their reputation was founded on quality products, of which the Force Ten range of tents were perhaps best known. They also made frame tents and sleeping bags. 1980 By this year, of the long established tents, only the Good Companions Standard, Major, and the Arctic Guinea, were available. There were, however, some new nylon tents, an Atlas range, and the long established Patrol tents. With decline due to recession obvious, it was all a far cry from the catalogue product list of twenty years ago. 1982 There were many problems affecting the camping and outdoor leisure industry in the seventies, some of them were ‘home grown’ through government legislation, while others were of an international nature. There was also the change in the public’s buying habits. These problems impacted on firms like the Black & Edgington Group, giving a few years of recession. This recessional period lasted for a period of five to six years and peaked around 1979-81. Pay policies imposed by the Government, which were intended to limit inflation, did almost the exact opposite. With demand greatly diminished, the result for the Black & Edgington Group was that the factories at Bristol, Sidcup and Greenock had to be closed. The head office factory at Port Glasgow and the Mitchell Unit in Glasgow were the only two which survived. It was in the middle of all these problems with closures that the Board had to contend with a predator situation with regard to a small amount of equity. A very small percentage holding was sold by one of the non-executive directors to a third party, who in turn sold it to a body interested in purchasing part of the group. With continuing poor performance from the B&E Group, the predator increased his holding substantially. This became the situation as of June 1983, when it was made clear by the predator that a full bid could be made within a few days. The initial reaction was to reject any bid, but financial advisers made it clear, that in the light of the continuing poor performance and the time it might take to restore profits, a ‘defence’ was impractical, and it was in the best interests of shareholders to ‘surrender’. To repeat - the function of jobs in the UK is to access purchasing power , not to produce. The function of jobs in the euro and Asian mercantile zone is to produce goods for export. No real domestic supply chains exist in either surplus or deficit countries. The goods are all/made externally. The crisis post 2007 relates to the continual breakdown of the worlds production / consumption chain. The skill base has disappeared. Energy costs remain very high in Europe. Coal burn is not being allowed to return in to Europe . The global barbell economy is collapsing yet credit monopolists are preventing the flow. Charlie Bean is an auspicious name. Very good post. The only point where I would disagree regards the term “rentier”. A rentier is just anyone who lives off the back of the work of others. That includes all children (up to 20 years of living off the work of others) and all pensioners (up to 25 years or more of living off the work of others whether through government or private pensions). That’s already about 50% of the average lifespan. We are a compassionate society so we can then include the unemployed, the sick and anyone whose pay is topped up by tax paid by workers or anyone whose housing benefit is a transfer from workers to landlords. We all buy more from overseas than we sell, so we pay for this by issuing bonds and paying interest in perpetuity to foreigners, or by selling them our top businesses and the best property in central London. When you say “we owe it to those people to stop pretending we can restore their lost returns” I agree but I think you are talking to everyone and all political persuasions. We have created a society where everyone is a rentier for much of the time. Our political debates are just about the relative merits of claims on the work of others by various stakeholder groups each of which sees itself as fully entitled to its own rent and each of which resents any rent paid to other groups. For example, many taxpayers resent paying for interest on government bonds but then complain when their private pensions, which are in part financed by the interest payments on these bonds, are reduced. I totally disagree that children are rentiers. 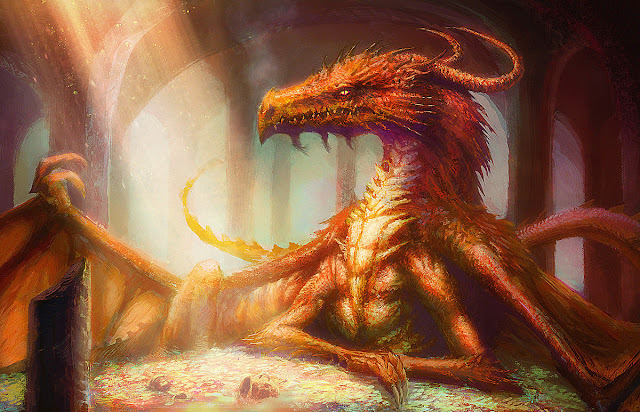 Rentiers live off the returns from capital. Children do not have capital - they ARE capital. Supporting them is investment. Otherwise, I agree generally with your comments. I included my point about children because you said “there is a continual drain of resources … from young to old”. This transfer is only possible because the old spent their capital investing in the young in the first place. It is therefore wrong, in my view, to see transfers as a one way deal as though the old are expecting something for nothing. That is not what is happening. We need to view the complete picture. We were all young once and we will (mostly) all be old one day. The young I refer to are not children. They are young adults. Yes, I understand that you were talking about young adults. Let me try to rephrase my point as I think it is an important one. The word “rentier” is typically used to refer to a class of people who live from the work of others for most or all of their lives. That was certainly true in the time of Dickens and Marx but that was an age when the education of children was not considered an investment and when the old were expected to work almost until they died. We now have a society where each cohort is allowed to live from the work of others at some stages of their lives (children, the old, the sick, the unemployed) on the assumption that each cohort also takes its turn to act as the workers. That seems to me to be a healthy system which mostly works to the benefit of everyone. When you say that “there is a continual drain of resources … from young to old” that is true if we just think about 2015. However, the young adults of 2015 were the children of 2000. At some point, they will inherit wealth when the old of 2015 die, and at some further point they will expect the young of that time to look after them. The real issue is not about one cohort exploiting another cohort. It is that all cohorts now take for granted the periods when they are recipients of the benefits of the system, while resenting the periods when it is their turn to be the workers. I'm afraid I disagree. In most countries the proportion of non-workers to workers (the dependency ratio) is rising drastically, due to falling birthrates, increasing longevity and the failure of pension ages to rise with longevity. The burden on workers of supporting both the young and the old is therefore increasing. I don't get it. If central banks permanently bring inflation down to 0% (despite proclaiming a contrary goal), then eventually nominal yields and real yields will converge. Rentiers would be delighted. Taxes are assessed on nominal yield, not real yield, so the lower the difference, the lower their taxes. I think the problem is the "contrary goal". These are ex ante real yields, which reflect inflation expectations rather than outturn. What the current 2% divergence tells us is that consol yields reflect expectations that central banks hit their 2% inflation target. Because they aren't doing so, that means that consol nominal yields are about 2% too high. Hence my remark about rentiers. And about expectations being skewed to the upside. By the way, what the historic pinning of real and nominal yields tells us is that in the past, people didn't expect inflation. 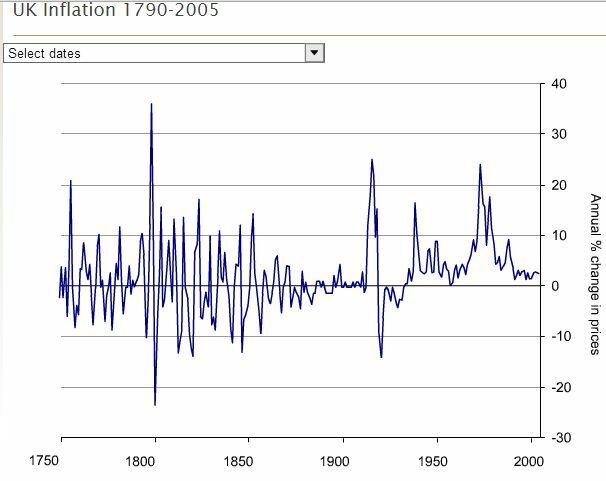 Though I would dearly like to know how the Bank of England could deduce what inflation expectations were in 1810. "continual drain of resources from workers to rentiers, from young to old and from poor to rich"
This seems to be designed, and is positive in some cases. Is this the reality of the richest generation ever (baby boomers) retiring? Labor's share of income is dropping, which is another way of saying labor's share of output is dropping. Can it happen any other way, if we want to provide a dignified retirement? The demographic problem may only be a transitory problem - the demands of baby boomers are an exogenous shock, unavoidable as humans approach peak population. All the more reason to rapidly increase fiscal investment to meet the desire to save during the current period of private sector lethargy. In my opinion, the key is productivity, but this would still show in the data as a declining share of labor income. right?